as we all know, large mirrors can be quite pricey. 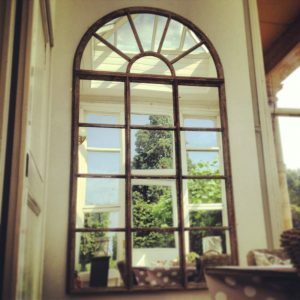 Smaller, cheaper mirrors can easily be found at second hand shops, discount shops and antique shops. When you’ve found your preferred group of mirrors, either paint the frames the same colour if you want to go for the more utilitarian look, or for a more eclectic style, leave them as a jumble. 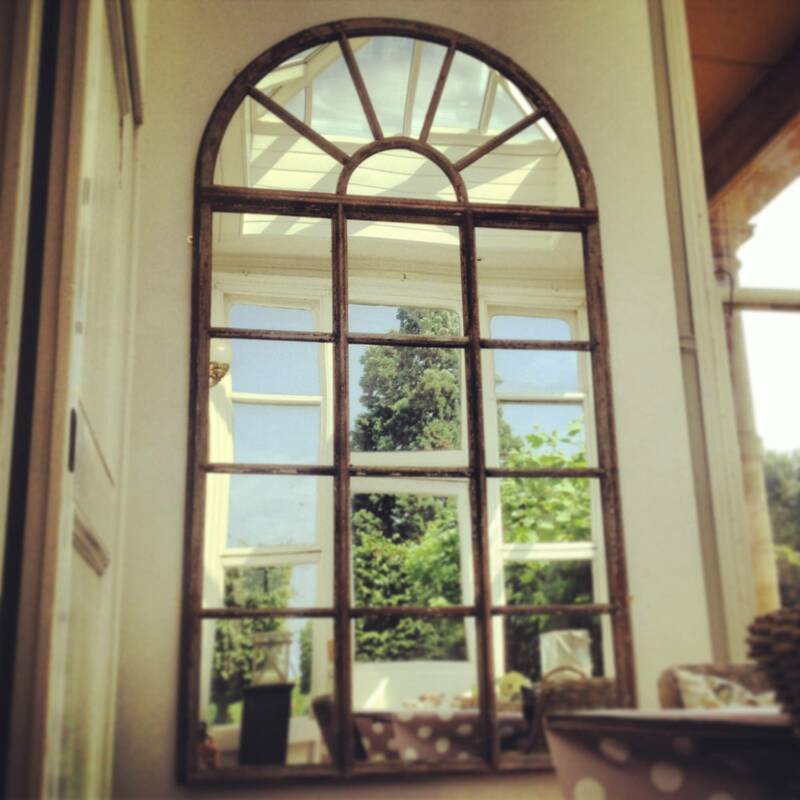 Once you’ve decided, get creative; build your own large mirror from your smaller ones. Unlike with a single mirror (except expensively cut contemporary ones), you can choose to create interesting shapes, or just stay within the normal bounds of rectangular or circular formations. You can use this method to make a really interesting group of different mirrors act almost the same as one large mirror would. Plus, you get the benefit of having a variety of frames, so no more painstaking decisions between the two you really like – just have them both. Really make a statement with them. You could even go one step further and make a feature of a broken mirror. This can be not only a great way to jazz up your room, it can also be a fun DIY project. All you need is a mirror the size you want, a piece of plywood slightly bigger than the mirror, some paint, and some no more nails. If you choose to do it yourself, ensure you sand sharp edges down properly or place well out of reach of children. Also, using this technique you can create interesting effects with the reflected light as it will refract slightly differently from each surface, depending on its height from the wall etc. …above fireplaces or to break up ‘art walls’; can go wrong, horribly wrong, but done correctly, they can also give your room, not only extra light and space, but also, that extra ‘something’ that makes people really fall in love with your house or really want to work in your office. 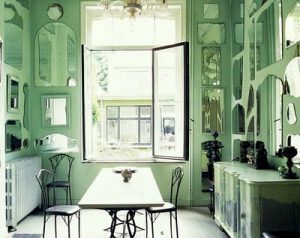 Be careful though, using the wrong mirrors on the wrong wallpaper can create gaudy eye-sores. 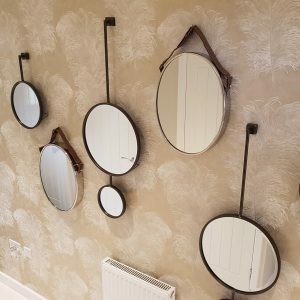 Patterned ‘feature’ walls are fashionable at the moment, but they can be heavy and dark, mirrors to maximise the light and add some character to your feature wall. If your feature wall is a particularly ‘busy’ design, try to tone it down a little with a large rectangular mirror with a plain but stylish frame. 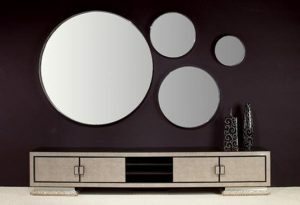 Maybe go for a bevelled edge on your mirror to add a bit of depth as well. If your feature wall is less busy and needs something to really draw the eye to it, try going for a large mirror with a more decorative frame. It will really bring your feature wall to life. 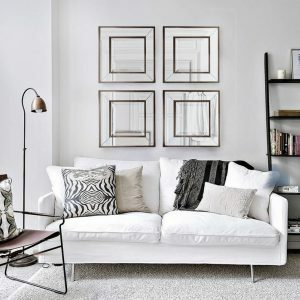 Also, if you have a wall which seems cluttered by the art or family photos you have covering it, try adding a small or medium mirror to the mix, it will break up the bank of pictures and provides an extra, airy dimension to stop the mass of visual information from becoming overwhelming. Think about using something with a very minimalist frame so that the light hitting the mirror attracts the eye rather than a large frame further adding to the mass of decoration on the wall already. 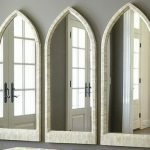 When used in this fashion, your mirrors won’t be the feature itself, but it will provide the perfect finishing touch and really set off the wall that is your feature. 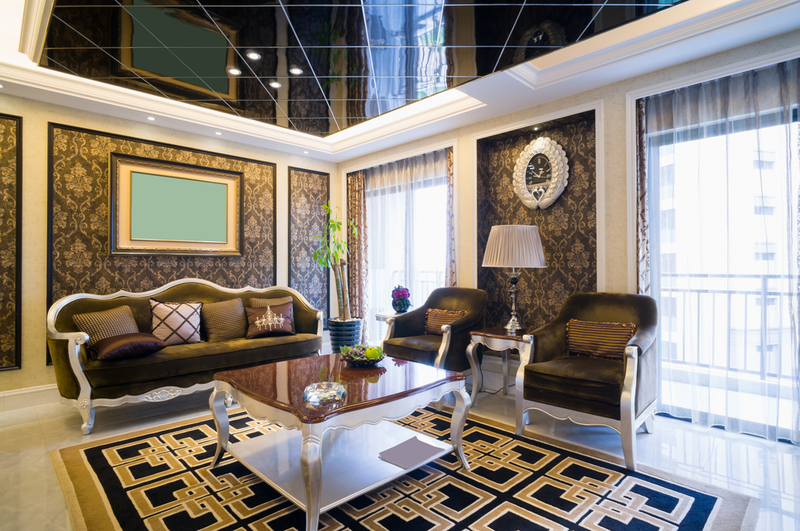 To help you build your perfect mirror quickly easily from scratch, we have worked very hard to be at the forefront of innovation in the field of Mirrors and Picture Framing. Introducing new and exciting designs and increasing our selection of different frame and mirror types, to grow it to be the largest selection in the UK. Our diverse and stunning array of bespoke mirrors with advanced online tools has empowered us to become an award-winning mirror company. With the growth of Premium paint companies like Farrow and Ball, Benjamin Moore, Annie Sloan, Fired Earth and the Little Greene Paint Company. We saw a gap in the market and have now brought together the more traditional style frame with beautiful paints to create truly s contemporary edge to such a classic staple that works well in any interior setting. We now offer a selection of ready-made and bespoke frames using these premium paints. The quality of our beautiful frames, lovingly hand-painted bestows you with products that are bound to create a definite wow factor. You have complete control in choosing your favourite colour of pain from any of these brands: Farrow and Ball, Benjamin Moore, Annie Sloan, Fired Earth and the Little Greene Paint Company. Mirror walls don’t have to make your house look like Hugh Heffner’s bedroom (not that there’s anything wrong with that if that’s your thing); rather than going for the option of covering an entire wall of your room with solid panels of frameless mirrors, try using several medium to large mirrors with antique or art-deco frames, or multiple small mirrors to give you a wall that not only turns your room into a piece of art, but also makes the best of the size and light available as well. 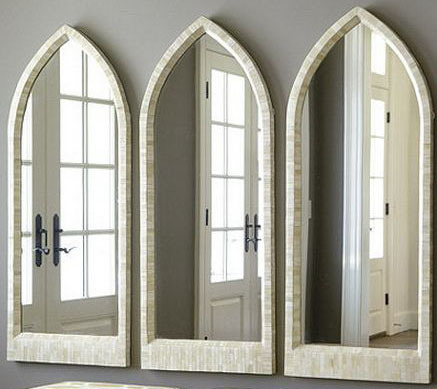 Use the same colour frame and shape for all of the mirrors and vary their sizes. This will give you your wall that is a piece of art in itself without making too much of a challenge out of it. The uniformity in shapes and frames will draw the effect together nicely, maximum style, minimal effort. You could also stick with the same coloured frames on your mirrors and vary not only their sizes, but their shapes as well. 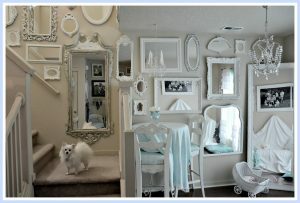 By doing this you’ll add an extra dimension to your mirror wall, just make sure you choose the right frame. 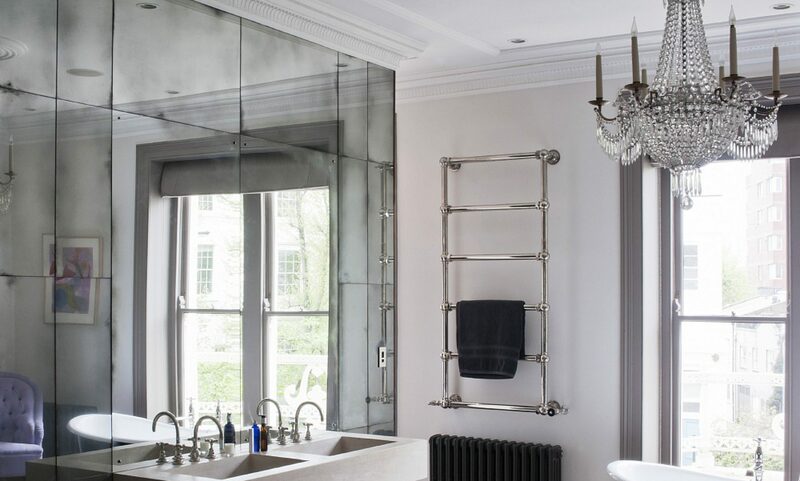 Finally, if you’re feeling particularly adventurous, you can use not only a variety of sizes and shapes for your mirror wall, you could use frames of different style and colour too. 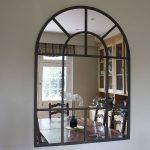 This will take a bit more effort, ensuring that your frames don’t clash with each other (unless that’s the exact effect you’re going for) can be a painstaking process, but if you get it right, this can indeed provide you with a truly fascinating and unique mirror wall. 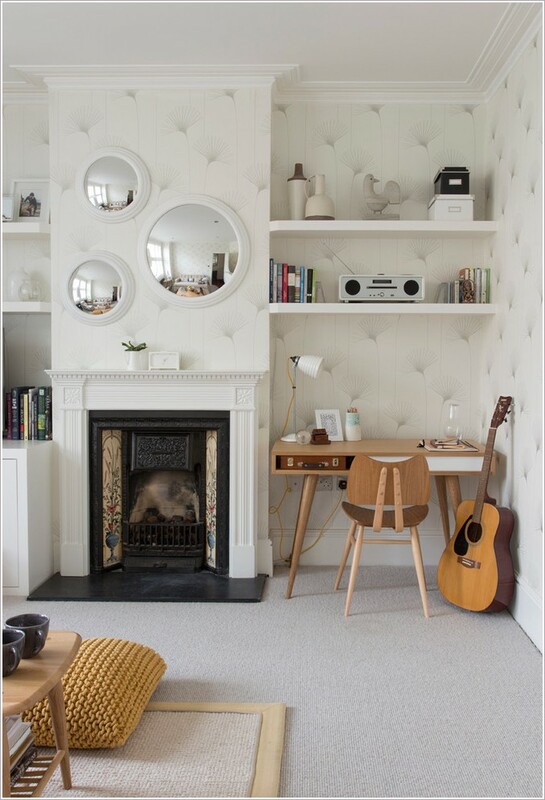 Remember, whichever way you choose to do it, plan first, maybe cut some cardboard into the sizes and shapes you want and have a bit of a play with them on the wall to get the exact pattern you’re after before you buy your mirrors – otherwise they could be an expensive mistake. Once you’ve got the plan laid out, order your mirrors and away you go. Creating a bespoke mirror wall in this style can be a really stunning way of giving your room the light and space it deserves. If you want to make your room seem both larger and lighter without using a lamp; use a mirror to create a ‘second window’ in the room. By placing a mirror directly opposite a window, you can enhance not only the light entering the room, but also the views that are available to you, enabling you to see out of your house from wherever you are sitting. 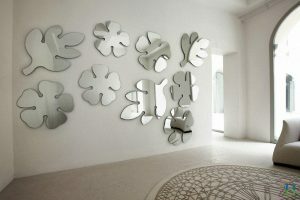 With this technique, you can also create your own art using a well-placed mirror – never worry what art to buy or get bored of looking at your wall again as the mirror you place opposite your window will provide a different piece of art to you every day of the year. Reflecting the snow in winter, the new greens in spring, russets in autumn and (maybe not in England) golden sunlight in summertime. This effect can be multiplied in a really interesting way if you use several small mirrors to create your window opposite the window. 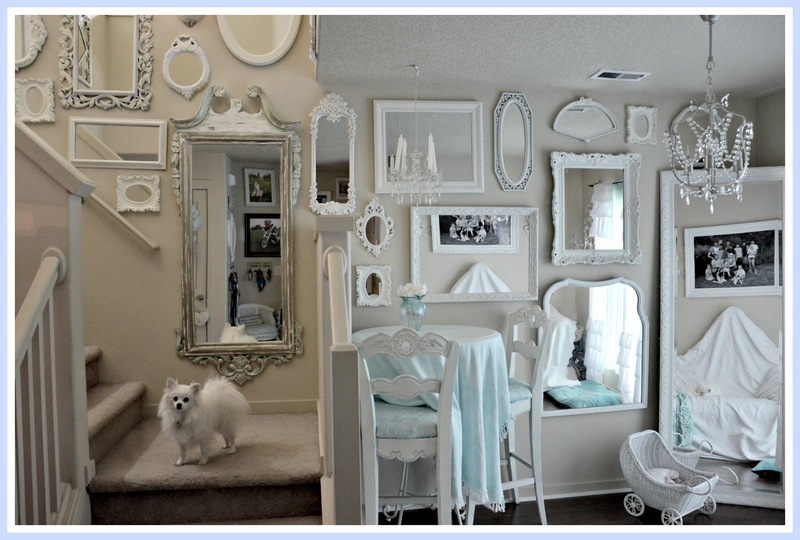 If you wanted to, you could also use a mirror (or mirrors) in this fashion with actual artwork you own. Place a mirror opposite your favourite painting, allowing you to see it from anywhere in the room. If you have artwork and a window in the same wall, you could even place a mirror on the opposite wall, centred between the two, to allow you to change the view depending what angle you’re looking at the mirror from – creating a stunning mix of views, both of the landscape outside and your favourite painting. 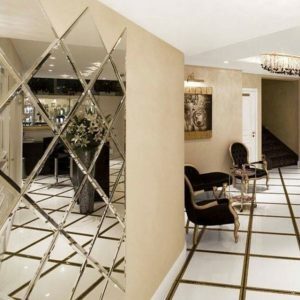 Mirrors are a fantastic way to create beautiful views on blank walls. 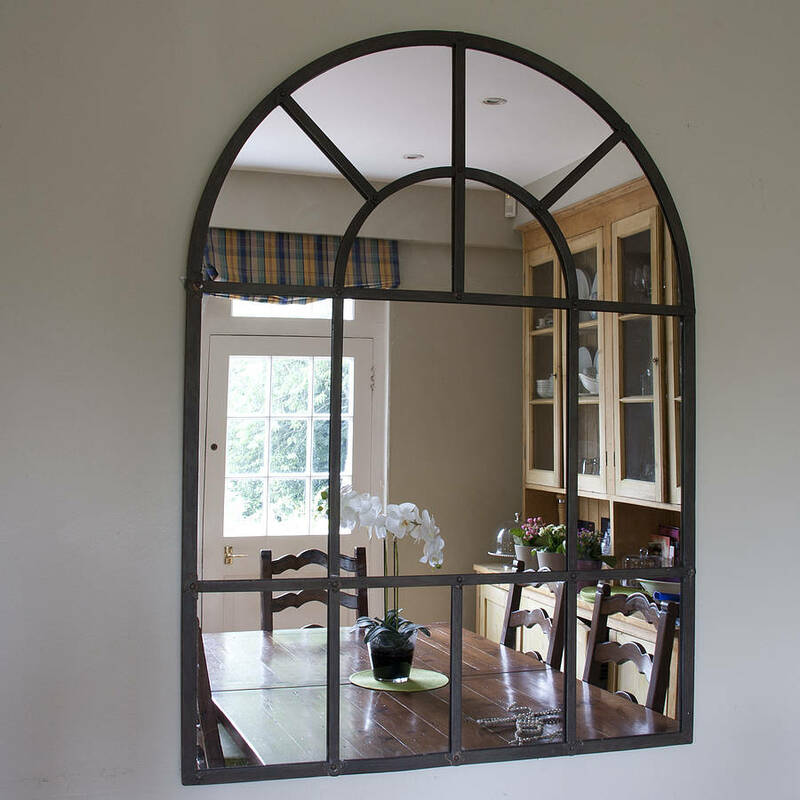 Using mirror windows like this you can see your garden from walls on the other side of the room.